When Enemy at the Gates came out, I backdated my Kursk T-34 company to the earlier model and added some KV-1 tanks to create a Mixed Tank Battalion [Article Reference Here]. Now that Red Banner is out, I’m in the process of updating it to the latest and greatest for Kursk. The first step is simple, I just replace the T-34 (early) turrets with the later ‘Mickey Mouse Ear’ turrets (so called because when the two circular hatches are open, they look like Mickey mouse’s ears!) that I originally painted. While the differences between the early and late T-34 are subtle, they are much appreciated by a speed freak like me. The later model is 2”/5cm faster through terrain and 4”/10cm faster across country, and has a Cross rating of 2+. This makes my preferred tactic of racing a mass of T-34s into the middle of an enemy tank group and engaging in a short-range firefight even more effective. At that range, and shooting into the flank of the enemy, the 76mm gun is very effective, while even the side armour is still good enough to bounce plenty of shots! It takes a Panzer IV (long) to match me in that firefight – anything less and I’ve got the advantage tank-on-tank. The next step is sort of the reverse – painting the late-model turrets for my Valentines. Fortunately, the kit has the parts for both early and late turrets, so I just grabbed the leftover bits and made three late 2 pdr turrets and four 6 pdr turrets. The late 2 pdr turrets with their space for an extra crewman get rid of the Overworked penalty (+1 to hit when I move), while the 6 pdr guns give me Anti-tank 10 (rather than 7) instead – but at the cost of no MG. This makes my Valentines quite a bit more shooty, although less effective against infantry and guns. While I love the Valentine (it’s sooo ugly! ), its slow speed makes it difficult to use with the T-34, so I’d rather something faster, so I’m painting a company of T-70 light tanks as well. These are like a T-60 on steroids. They mount a 45mm gun (even if it only has one shot!) and have decent armour and speed, but are still dirt cheap. 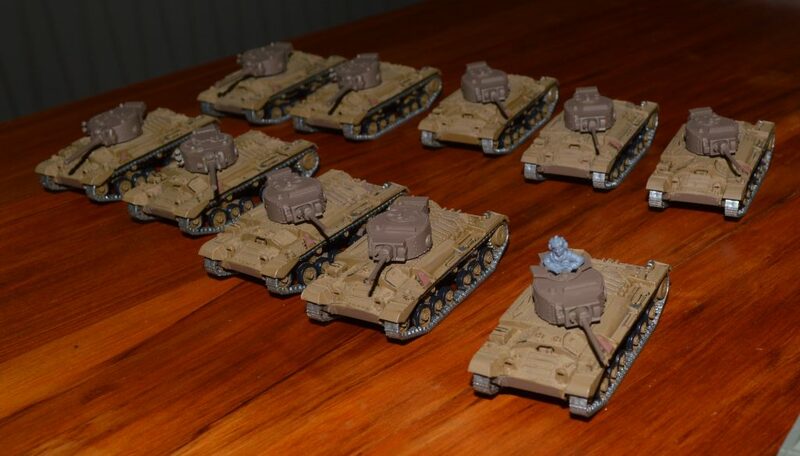 While they are way faster than the Valentines (and at least as fast as any opposing tank), they still feel slow compared with my T-34s, but with ten for less than the price of three T-34s, they make a nice cheap flanking or distraction force. Finally on the tank side, I’m adding a company of Churchill tanks. Like the Valentine, they are so ugly that they are beautiful, and I just had to make some of the new plastic kit. Fortunately for my not-so-inner geek, the heavy tanks supporting the tank corps at Kursk were Churchills, so they go well with my T-34s. The Churchill is like a slightly faster and less armoured KV-1 (a bit more armour than the way faster KV-1s). Its gun has similar performance against tanks (slightly higher Anti-Tank, but worse Firepower mean more Bailed Out, but roughly the same number of destroyed enemy tanks), but with No HE, it’s way worse against enemy guns. The price is cheaper, but they’ll need some support to come out on top. Between the two forces, I now have most of the Soviet and British Lend-Lease tanks to choose from, so that’s a plus when I want a bit of variety. The new plastic Katyusha rocket launcher is too cool to leave out, so I’ve grabbed four of them as well. Now I’m not convinced of the need for artillery in a hard-hitting tank force, so it’ll be a bit different for me. On the other hand, having a big Salvo template means that their ability to pin down targets quickly and reduce their threat to my tanks is going to come in handy. Having built one in the Enemy at the Gates launch event, I wasn’t surprised by how easily they go together for such a complicated looking model, but it was nice when it came time to make four of them. I haven’t picked it up yet, but I’d also like to paint up an SMG company to go with my tanks. I love the image of tanks covered in infantry racing forward, with the infantry dismounting and unleashing a hail of fire as they roll over the enemy in a combined-arms assault! 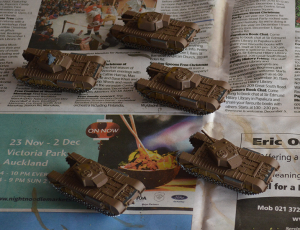 Once the tanks are done, they’ll be next on the painting table. For the remaining two points I could have Partisans to slow down enemy Reserves, Reconnaissance by Combat to start the game with my Katyushas Ranged In where I need them, ot Guards and Lucky together to make my tanks Remount better and counter a bad die roll. At present I’m liking Partisans to give my tanks an edge in numbers. Alternatively, I could add in three Churchill tanks to support the infantry and drop the T-34 and T-70 companies to six tanks each. It would be a very different force with a much slower strategy. The infantry and Churchills would be the lead elements, with the tanks tanking the role of Reserves or a flanking force stalking the enemy rather than the spearpoint of a headlong rush. The only way to prove whether this particular pudding is worth eating will be to try it out in battle. It’ll be interesting to see which version has the most success.